In the story of human breast cancer, two major findings markedly modified the clinical approach to treatment. Both belong to endocrinology. The first brought to light the hormone dependency of certain tumors and paved the way for ablative endocrine surgery . This, however, did not help in the selection of patients before the initiation of treatment. The second was the discovery of the estrogen receptor (ER) machinery in normal target cells and the same mechanism of hormone action in tumor target tissue [5,6]. This opened up a new area in the knowledge of breast cancer. 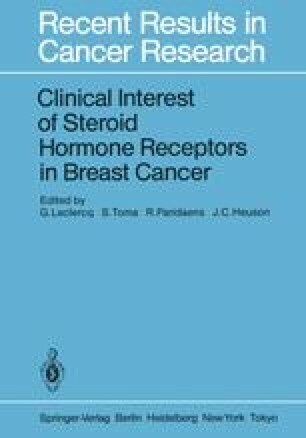 Further investigations demonstrated that breast tumors contain receptors for other steroids, some of whose functions have still not been elucidated. Progesterone receptors (PgR) have a unique place alongside ER since their synthesis has been demonstrated to be both estrogen and estrogen receptor dependent in several target tissues, such as endometrium, and in the mammary tumor epithelial cell line [2, 3]. In view of this, it was suggested that the existence and the quantity of ER and PgR might be regulated, even in tumor tissue. To test this hypothesis we analyzed tumor receptor contents in relation to endocrine parameters, menopausal status, and plasma estrogen and progesterone levels in 621 breast cancer patients treated in our institute.